The Utah Valley Marathon was named a Top 10 Race by Runner's World Magazine. The course is a fast Boston Qualifier that is almost entirely downhill. The scenery is incredible with waterfalls, a reservoir, Provo River, and the Mountains. After you set your record time on our fast course be sure to ring the PR Bell in the finish, so that everyone can join in your celebration. Join us this June! Very enjoyable/beautiful race, good steady decline, very few hills, and a great crowd once you get into town. Devin S. has run 1 times 1/1 found this review helpful. I ran this half last year and it was my first. The declines are really gradual and that helps with a beginners knees. The aid stations were quick and thank goodness for the Honey Buckets! Danielle S. has run 2 times 3/3 found this review helpful. I loved everything about this race. Utah Valley is my new favorite race. I signed up for this race after a very disappointing race at Ogden in May of 2015 and it wasn't just the weather. The Utah Valley had friendly volunteers and the atmosphere was awesome. My kids ran the Kids K and were thrilled with the medals and the experience of running the finish through line. Bravo on one awesome race experienced by our family. We are looking forward to next year. Thank You!!! Tiffany G. has run 1 times 3/3 found this review helpful. Great course! The boy scouts aid station was the best, they had delicious cobbler!! Sarah O. has run 1 times 1/1 found this review helpful. Loved the race, and the K9 dash was awesome. Loved running with my dog and will definitely be back. Thomas T. has run 1 times 1/1 found this review helpful. Love this race! Well organized and beautiful! Just wish the last 6 miles were more downhill! Starr D. has run 4 times 1/1 found this review helpful. This race was fun on a fast and easy course. It was my first marathon and I was blown away with how well organized and ran everything was. It was a great experience and I look forward to running again next year. Jeremy A. has run 1 times 2/2 found this review helpful. A solid race! Can't go wrong. Most of the course is very beautiful, and has a quite a lot of downhill. The last few miles have some uphill and aren't especially interesting (though I run that course a LOT so I might just be sick of it). The aid stations always had enough water, food, and volunteers when I've passed through. The end-of-race celebrations are well organized, though parking in downtown Provo is what you would expect (a hassle). But I really do love this race, and I think others would too! It's worth doing! Lurel W. has run 4 times 2/2 found this review helpful. It's the atmosphere that makes this race great! You can say what you want about the actual course, everyone has differing opinions about hills, steepness, etc., it's the atmosphere that makes this race so great! Not only do the race organizers make sure everything is top notch (expo, start line and finish line, aid stations), but you also have streets packed with people the last 6 miles, cheering you on and helping you fight your way to the finish. I absolutely love the support that Utah county gives for it's runners. Zach H. has run 3 times 3/3 found this review helpful. I was having IT band issues going into this race so I promised myself just to go with it and have fun. This was the perfect race for that (other than the fact that it's alllll down hill. My IT Band did not like that part)! The volunteers were fantastic, the course was gorgeous and the Boy Scout water stop is by far the best! I will be back and plan on PRing on this course. Kyrie L. has run 1 times 1/1 found this review helpful. Snacks were awesome, the staff was friendly, the race was very well-run. All of us runners got to just support each other and not worry about anything. Kim B. has run 1 times 0/0 found this review helpful. That was awesome! The course was perfect on that decline, with awesome people at every stand! Ryan M. has run 1 times 1/1 found this review helpful. Great race. Nice amount of hydration stations. Overall good experience. Thanks. Ryan G. has run 1 times 0/0 found this review helpful. Course was organized well. Frustrated that the marathon was advertised as a "Fast Marathon" as the canyon had numerous hills. Not a fast marathon. John B. has run 1 times 1/1 found this review helpful. Really, no water at the finish? The finish was bogged down and folks were strolling over the finish line so that runners had to walk behind. I did not see a big change due to 10-year anniversary. Doreen S. has run 3 times 0/1 found this review helpful. I am sorry you had a bad experience. We had over 1,000 gallons of water left over at the finish. It was right in the runner corral and had 6 different volunteers handing out both water and Powerade. I am sorry to hear that you didn't see this, but we never ran out of water. View all Utah Valley Marathon, Half Marathon & 10K reviews. This is a beautiful half marathon course. You run around the base of the mountain and so the mountain blocks the sun. I was in the shade for like the first 10 miles. It helped to keep the temp cool and the views were amazing. The end of the race had so many snacks and food to eat. The medals were high quality. I have completed a lot of races and this was one of my favorites. Based on a 5 year average and a race date of June 1st, Provo, UT can expect temperatures between 54℉ and 85℉ with humidity around 36% and precipitation of 0". Raceentry.com also cannot attest to the validity of individual Utah Valley Marathon, Half Marathon & 10K reviews. All of the information about the race has either been supplied by the event staff or can be modified at any time by their race management. 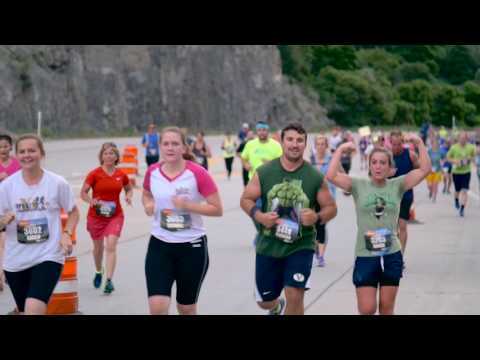 2019 Utah Valley Marathon, Half Marathon & 10K registration details are only as accurate as the event has made them.